Good concepts always come true in the world of jailbroken iPhones, was first Auxo, the concept of multitasking to iPhone 5 , and now this concept is to not forget important messages. This new tweak, which is not yet available in Cydia, will give us the option to remember that we have received an SMS when we want. It's simple, read the message is important and know that you will forget, because you just have to leave the message down and with the option of copying see a new option "Remember", by selecting options appear: 1 minutes, 5 minutes, 15 minutes or 1 hour. The message will ring again after this time, and so you certainly will not forget that important that you have received. As I always say it's a shame that we are so accustomed to using WhatsApp and more IMessages not use because we miss some good modifications how are you and many of us use WhatsApp iPhone having among us can use IMessages. Click on the file named "Com.jbp.smsremind_0.0.1-1_iphoneos-arm.deb"
If you do not want to do this or do not know how I recommend waiting, surely the tweak is available in Cydia in a few days. 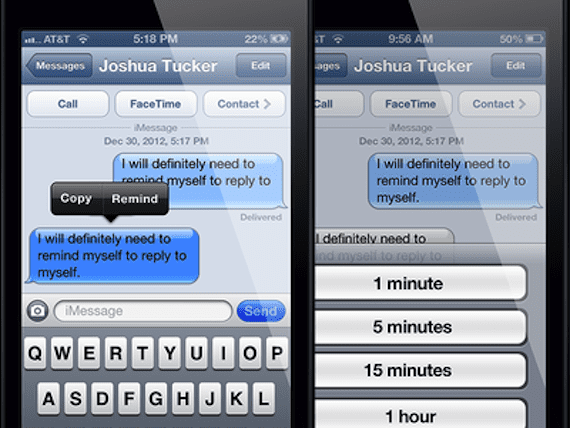 Article Reminders for messages: another concept becomes reality (jailbreak) was originally published in News iPhone .